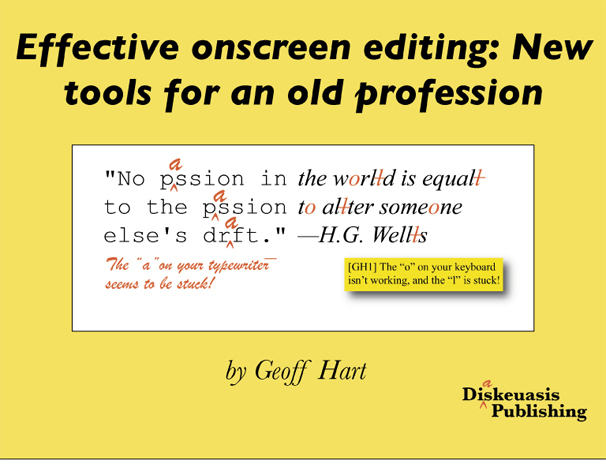 Effective onscreen editing: New tools for an old profession, by Geoff Hart. Pointe-Claire, Quebec: Diaskeuasis Publishing, 2007. 723 pages. Ebook. ISBN 978-0-9783227-0-0. US$20 outside Canada. Mind the Gaffe! by R. L. Trask. New York: Harper, 2001, 2006. 290 pages. Paperback. ISBN-13: 978-0061132209; ISBN-10: 0061132209. $11.16; ¥1474. Reviewed by Richard Weisburd Ideas into Words: Mastering the Craft of Science Writing. Elise Hancock. Baltimore: Johns Hopkins University Press, 2003. 176 pages, including front matter and index. ISBN 0801873304 (softcover). US$18.95. Reviewed by Hugh Ashton The Language Instinct: The New Science of Language and Mind. Steven Pinker. London: Penguin, 1995. 494 pages, including preface, notes, glossary, and index. ISBN 0140175296 (softcover). £9.99.